I’ve seen Horseshoe Bend a few times in photographs on the National Geographic website, but when we got to Arizona I started seeing the image quite frequently in magazines and in art shops. 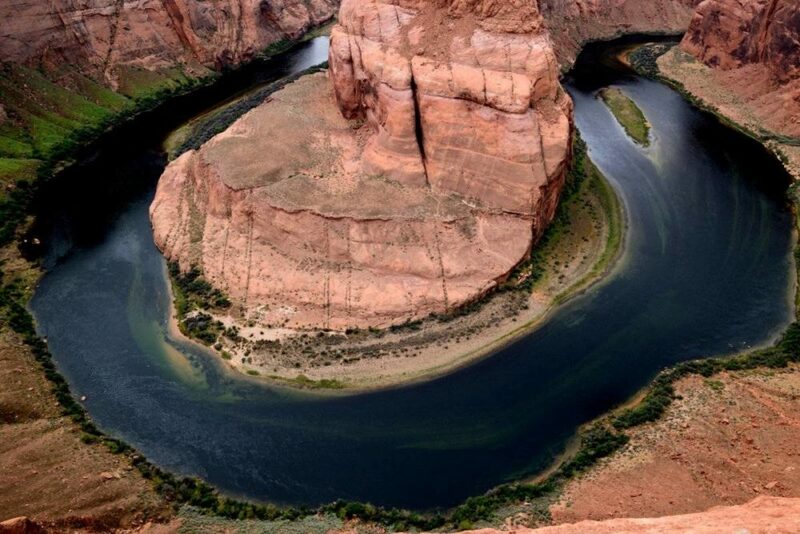 If you’re wondering, Horseshoe Bend is a horseshoe-shaped meander of the Colorado River, just 5 miles downstream of the dam and 4 miles south of Page, Arizona. We went just after our tour of Upper Antelope Canyon. There’s a dirt parking lot which gets crowded fast, but since it was threatening rain, it’s not that crowded. The trail is 1.5 miles roundtrip and takes about 45 minutes to walk, despite the sand. And boy, there’s a lot of sand on the trail. It’s old sand, according to the sign: about 200 million years ago this sand was part of the largest system of sand dunes in North American. These “sand seas” are known as ergs. The ergs were eventually hardened by water and minerals into Navajo Sandstone – a layer that’s amazing uniform and very smooth. 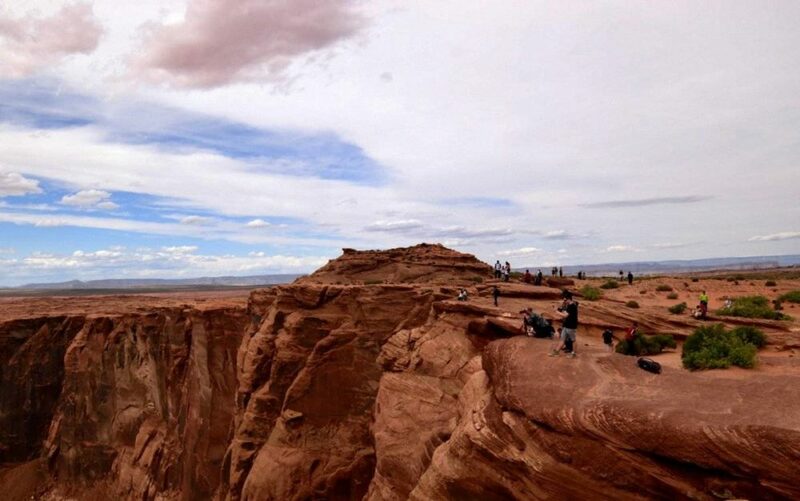 This layer of sandstone stretches from Arizona to Wyoming, and it can be over two thousand feet thick in some places. Wind and water turn the Navajo Sandstone turn the back into the sand. Given another 200 million years, I’m sure it will turn back to stone. Pretty amazing stuff, even if it gets in your shoes. 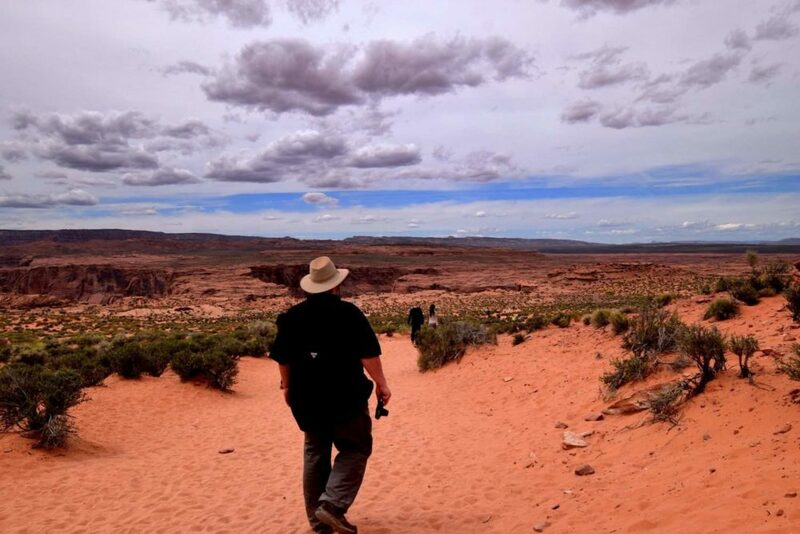 Walking on the trail to Horseshoe Bend, the view is rather deceptive and before you know it you’re looking down a 1000 foot cliff at the Colorado River. Man oh, man is it a drop once you reach the edge. Hitch often describes the physical effects of his vertigo. I must admit, that at this height and being on an outcrop of rock looking down sets my little lizard brain off. But there is a mighty reward for this risk: a stunning view of the river and the canyon below. I’m no pro at photography, but with a bit of effort, a wide angle lens, and a steady tripod nearly anyone can get a pretty good shot. On this day, I brought my 35-16mm wide angle lens. Its one of the few times where I wish I had something that went to 14mm. If you’d asked me, on that day I would have given anything for a 15mm fish-eye lens. Thank goodness for digital storage; it means I can take tons of images from all angles of the cliff. I’m also glad I brought my neutral-density filter, which I always pack with me when I know that there will be an overcast that day. Looking down into the canyon, I can tell that much of the area doesn’t get direct light, except at midday at high summer. But there always comes a time to put away the camera, just enjoy the view. Amid the selfie-stick waving tourists, its hard to find your bit of peace in a fantastic place, but it’s possible.